← Well, okay. Now it’s raining. This happened yesterday evening, and it gave me a real pang. 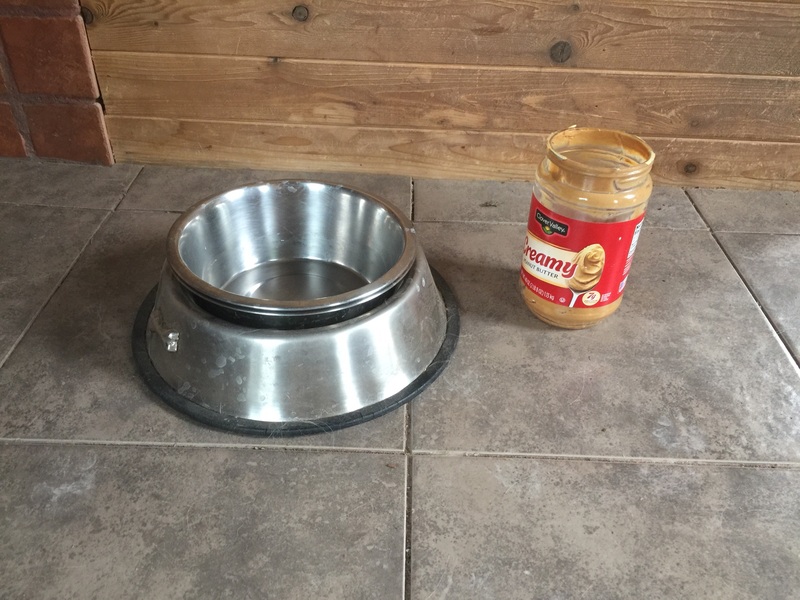 What am I to say about a dog that doesn’t like peanut butter? Just maybe he’s previously had same and experienced the “stuck on the roof of my mouth” thing, and he’s smart enough to not do THAT again??? Your new dog obviously came with an undisclosed factory defect. Ruger did not know what to make of peanut butter at first. With a gradual introduction and some peanut butter biscuits, he is now a peanut and peanut butter fiend. Be patient, Laddie may learn as Ruger did. Maybe he’s allergic to peanuts? Not a common food in his ancestral history. But as you are the leader of the pack, if he sees and smells you eating it he’ll eventually want some too. At which point he might bloat up like a sumo wrestler or Michael Moore and choke to death. Then won’t you feel bad about ignoring his peanut allergy! Laddie has eaten peanut butter before; he’s dog enough to be an incurable beggar. But apparently he preferred the bread or the jam to the butter, because when I set down a jar smeared with the stuff he looked at me like he’d suddenly figured out where I escaped from and then walked away without giving it a sniff. It’s still there: he’s still ignoring it. Joel, someone may have mentioned this to you before, so apologies if this is redundant, but since you’re a connoisseur of Dollar Store foodstuffs, it seemed apropos given the subject matter. Apparently some of the brands of peanut butters (and various other food stuffs) have been switching to xylitol as their sweetener rather than sugar. Xylitol is very toxic to dogs. Worth keeping in mind. Good to know, thanks. I just looked at the ingredients and this is sweetened with sugar and molasses. In fact I’m pleasantly surprised at how simple the ingredients are.